More images from Marc Jacobs’ Spring 2015 campaign have leaked today and that means we finally get to see the full cast of nine models in all their glory. 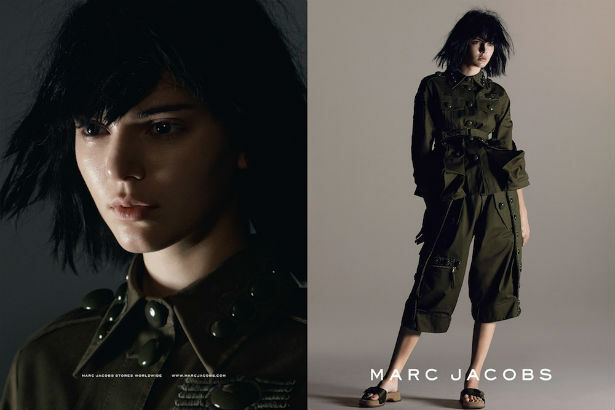 Kendall Jenner, who has gained the unconditional love and devotion of campaign stylist Katie Grand, joins Anja Rubik, Karlie Kloss, Adriana Lima, Joan Smalls, Natasha Poly, Anna Ewers, Issa Lish and Jessica Stam for Jacobs’ latest, shot by David Sims. Each model dons a chunky black bob with blunt bangs, moodily peering from underneath their fringes. If this is what Marc Jacobs’ army looks like, somebody better tell us where we can enlist. Check out the campaign images below.